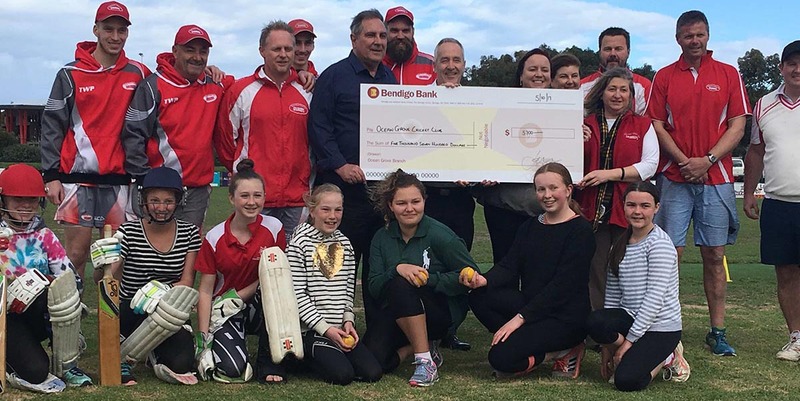 Image: Bendigo Bank Ocean Grove branch manager David Ellis with Helen Butteriss and John Mamonski from Ocean Grove Connected Communities present the cheque to Ocean Grove Cricket Club. The Grubbers, the Bears and the wallabies all got a boost in Ocean Grove Connected Communities’ latest round of grants. Ocean Grove Cricket Club (The Grubbers) received $5700 to purchase two new roll out pitches. Club president Peter Hart said the pitches would benefit junior cricket and the introduction of girls teams. Junior cricket is undergoing a change to fewer players (7 instead of 11) and a shorter pitch, which means two games can be played simultaneously. Another major change is the introduction of girls’ teams for the first time in the club’s history. The girls’ competition is currently underway, with the Grubbers fielding two teams in the competition. In other recent grants presentations, Ocean Grove Nature Reserve received $1000 to help raise awareness of the need to protect wallabies and will run a competition to develop a wallaby mascot. Bellarine Bears Baseball Club also picked up a $2000 grant to buy a grass line marking machine.